Does the price in red for the Epson AL-C1750N high capacity toners include VAT or has this to be added? The price of Epson C1750N toner cartridges displayed in red font is the price excluding VAT. The price shown in grey font is inclusive of VAT. I'm just wondering if Epson C1750N ink comes with the printer and, if so, how much? Does the AcuLaser C1750N print A5 sheets and up to which gsm thickness? If you're a business user looking to reduce print costs then consider the Epson AcuLaser C1750n. The printer is identical to its cousin the C1700, but with the addition of Ethernet connectivity, allowing multiple users to print at once. This C1750n can print in mono and colour, and has the added functionality of a duplexer. The Epson AcuLaser C1750n is very compact for a business printer, measuring just 234 x 394 x 304 mm, in addition its paper tray can fold away when not needed. It features a 160 sheet paper tray and comes with a number of functional buttons that allows you to control the printer independently without having to have access to a computer. 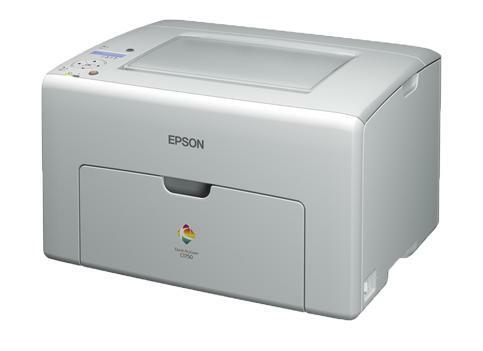 The addition of Ethernet connectivity brings the Epson AcuLaser C1750N into contention for use in a business environment, while its print quality in terms of text is great. Another bonus is the efficiency of the printer - businesses are able to make print savings thanks to the duplexer and the high capacity of the Epson print cartridges. Unfortunately Epson missed out in not adding additional connection interfaces to this device. WiFi would have been a real bonus, especially for the small cost saving kind of businesses it's aimed at. Furthermore the Epson AcuLaser C1750N average print speed is only 15ppm in mono, and 12 in colour – this is far from fast for a business device, while the paper capacity could also prove to be a downfall for businesses that print in volumes.